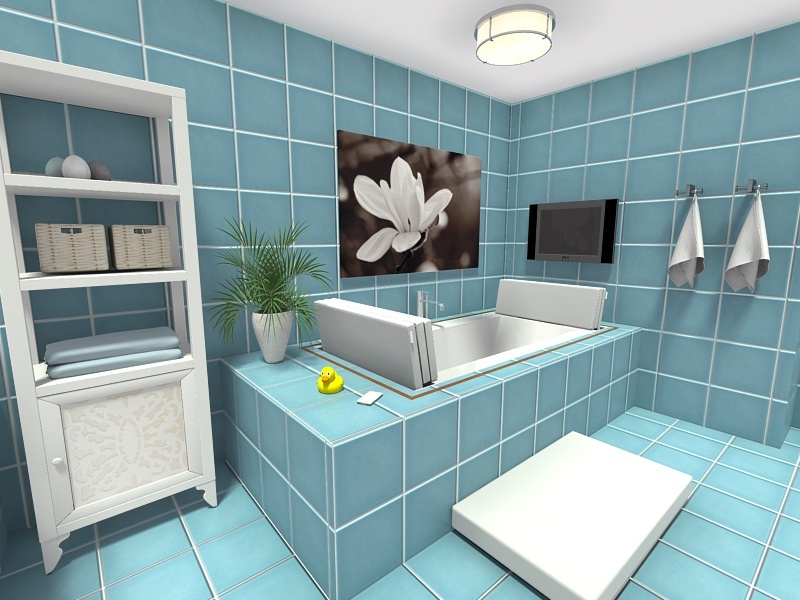 In this article, you’ll find tips on how to create a raised tiled area around your bathtub. Switch to Materials mode, and open the Tiles category to browse (or use the Magnifying glass to search for certain types of tiles such as Subway Tiles, or Green Tiles). Add your favorite tile - when asked if you want to add it to the Floor, Walls, or Both, choose Both. Open Furniture mode and search for your bathtub. Drag it somewhere onto the floor plan - it doesn't have to be in the final location yet. With the bathtub selected, its Properties appear on the right. Note down the Width, Depth, and Height. In our example, the bathtub is W-1578 mm, D-750 mm and H-590 mm. Zoom in to the floor plan. If needed, click the Add (+) tab to view the drawing buttons. Inside this zone, draw another zone which is where you will place the bathtub (we'll call this the Bathtub Zone). For now, draw it close to the size of the width and depth of the bathtub. We'll make it exact in the next step. The Bathtub Zone must have the exact same dimensions as the bathtub. To type exact dimensions, click the Select button and click the end of a divider line so that 4 arrows appear (note: click the end that you want the size change to occur at). On the right, type the Length to match one of the bathtub dimensions. Click the end of an adjacent divider line, to type the Length of the other dimension. To add tiles to the Raised Zone and Bathtub Zone: click on the tiled floor area in your floor plan, click the Copy button in the top toolbar, and then click on the Raised Zone and click the Paste button. Select the Raised Zone, and on the right, click Advanced Properties. Set the Floor Height to the same height as the bathtub (in our example, 918 mm). To turn off Floor Strips: Click the Levels button and click Level Properties. Turn Floor Strips to OFF. Now open Furniture mode and drag to place the bathtub in the Bathtub Zone. Tip: If you need to, zoom in to get an accurate result. Then decorate your bathroom with plants and pictures for that final touch!